Our brains also predispose us to be creatures of habit. As such, I suggest that these patterns can also apply to how we approach websites. When we encounter patterns that are familiar to us, our brains can more easily make sense of them. When we are born, our brains contain undeveloped neurons. When we experience something, such grasping a finger of a parent, pulses of electricity move along the effected neuron and out through fingerlike appendages at the base of the neuron called dendrites. The electrical current stimulates other dendrites and passes the current along the pathways of the brain. As the stimulation continues, more dendrites grow and protective sheaths form around the neurons.The more we do a specific activity, the stronger the neuronal paths become. In a a very real sense these activities become comfortable to our brains because of the frequent repetition. We have all experienced how learning new material is easier too, if we can tie the new material to something that our brains already know. For example, we see this play out in schools where well-known songs are adapted to help children learn the times tables. In my opinion, the brain’s need for predictability is a huge reason for keeping things simple and somewhat predictable on a website. We all know that good, accessible content drives successful sites. Whether a site is less than stellar in appearance; such as, Craig’s List, or as flashy as the NFL’s site, regardless of the presence or lack of frills, the successful site’s content simply makes sense to the user’s brain without the need to expend a lot of effort in trying to figure things out. When a user goes to a well-designed site, the experience creates a sense of comfort for the brain, because it encounters a degree of predictability in what it expects to see. Even when a site is packed with multiple choices, such as those found on Amazon.com, understanding how the brain works allows designers to structure content so that it draws users to click through into the site. We see something that is familiar to us, such as a keyword, and bam we give our brains what it expects. A few neurons fire as we click the mouse and we watch the page change, and then we experience the momentary pleasure of a desired experience. This may seem over-simplistic, but I don’t think it is. If people recognize something in a way that is meaningful to them, they will respond with relative ease, exactly because it has meaning for them. If a word is figuratively shouting, “Hey, I’m a link. I have a blue line under me,” savvy web users will know that they can click on the link and it will bring results. For the first-time web user, however, a blue word or phrase with underlining is not likely to have any meaning until they learn what the link does when it is clicked. In drawing upon my thirteen plus years as a public librarian doing thousands of searches, if a site interface was too out of the ordinary and did not make at least some degree of immediate sense, I often ignored it. I usually did not have the luxury of spending time, with patron waiting for a quick response, to poke around the site at length. When not engaged in the immediacy of helping a patron find an answer, I could later return and peruse the unconventional site or database and discover what it had to offer. After exploring it, my brain understood the navigation tools, because it then made sense of the funny, wordless icons that previously had had little meaning. With the cognitive connection made, it was easier to navigate the site when the need arose again. Once that familiarity was established, the brain could more easily synthesize the content because it made the connection with the meanings behind the icons. Our human brain biases us to think that the way we see the world is right and better than those around us. It also biases us to think that others generally perceive the world the same way that we do, when in fact they may not. How does this apply to good web design? 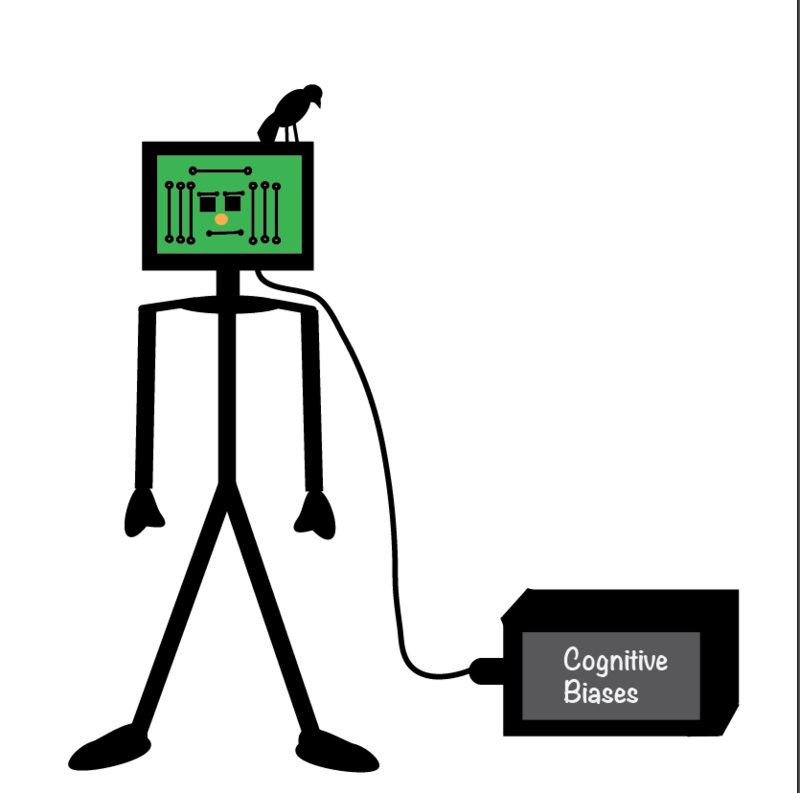 More on brain biases. It’s a sobering reminder to realize why it easy to think that our perceptions are the only ones that matter, when that belief does not reflect the larger, collective reality. The larger truth asks that we acknowledge that other ways exist to perceive and experience the same content, which we ourselves as consumers of information, may think is very clear and straight-forward. This ambiguity is exactly why user-experience testing enhances the usefulness of a website. It transcends the blind assumptions that web developers and copywriters can easily make in developing a site. Working as a front-line librarian taught me a lot about people. When difficulties arose, it was usually much more productive to try and help the patron save face, even though I knew their assumptions were erroneous. Fro example, sometimes library patrons asked for help in finding information on a specific site, even when it was not there. I used these “opportunities,” if I had time, to gently teach a little information literacy and to show the patron how to search a specific website for credible content. Great value exists in empowering people to understand how to find their own information. It creates trust. Often times the patron’s error in judgment was rooted in lack of experience in using the internet; such as, a senior not understanding how searches work and that the sponsored links were not going to give them unbiased information on a product. After looking at the problem site together, I nudged the patron in a different direction, until we were able to encounter a workable solution; and most importantly, where the customer still kept their dignity intact. That sounds simple enough to do, but it was not always easy. Of course, web designers could assist the user to be more savvy in their searches, by clarifying and redesigning sites, but sometimes the goal at hand asks for ambiguity as opposed to total disclosure. For example, the need to show ads on a search page might discourage designers from making it clearer that a “sponsored link” is really just another euphemism for advertisement. With time, however, the user usually figures out what that phrase really means and they usually avoid it. That forces the question of how effective using obscure language really is in the long-run. Using terminology that people understand exactly as an advertisement makes it easier for their brains to make sense of the content and for them to make more informed choices. It also saves them valuable time in not wasting their efforts looking at unwanted blather. However if one of the site’s goals is to manipulate people into clicking on ads, then the latter considerations may have little bearing on how the site is designed. Ginny Reddish in her book, Letting Go of the Words calls for using language in designing websites that is easy to understand for all levels of users. For me personally, when I experience an ad that I do not want to see, it has the opposite of the intended affect. I feel irritated and perturbed that someone is pushing a product onto me that I do not want to see. On the higher, more ethical road, using simple, clear, understandable web language engenders a sense of compassion for all users. It helps to remove the idea of the consumer as object and replaces it with the construct as a person whose time is valuable. When a person understands the lingo on a site from her given perspective, precisely because the language is clear to her, then the user can more easily make informed choices in how she wants to consume the site. She is less likely to click through to places where she does not want to go. Smart searches where suggested search terms are offered to end-users are now being utilized more and more, as well as attempts to use natural language search queries. These are steps in the right direction, as they give the brain familiarity and connection to the content being consumed. This technology also takes into consideration that people’s brains do not process information the same way. People need different options to help them be successful in their searches and site navigation. In that sense, web designers have the opportunity to empower people in their search abilities instead of limiting their successes. This entry was posted in Cognitive and Social Biases, Librarians, Web Design and tagged Cris Evatt, Ginny Reddish by Cristi Jenkins. Bookmark the permalink.